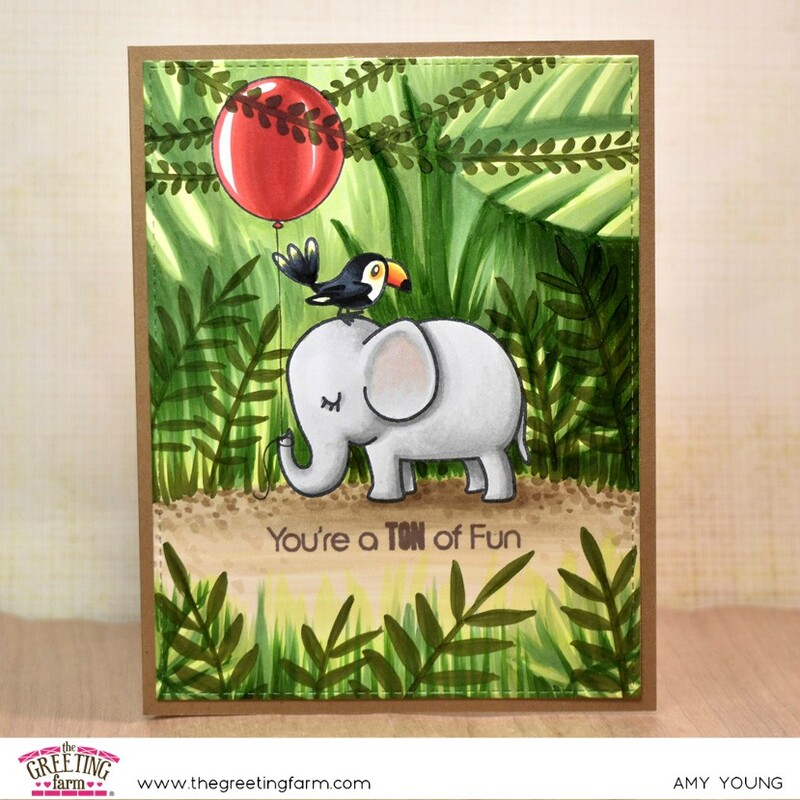 As summer continues to roll on I wanted to get this adventurous card that I made for the TGF July release posted here. As soon as I go my hands on the Mega Mini Summer set I knew that I wanted to take a couple of them on everybody's favorite summer activity... camping. And when it came to finding all the little accessory stamps to help create that scene, I didn't have to look any further than the TGF May release of the S'more Fun set and its digi add ons. Looking at these stylin' cuties I knew right away they would not be tent camping thus I inked up the travel trailer so they could 'rough it' in luxury, LOL! Because the accessories in the foreground come from a digital set I was able to resize them a bit bigger and really make the picnic table and cooler proportional to Anya and Ian... gotta love that! Have fun checking out all the new goodies! Alrighty then, the new "BIRTHDAY" challenge just got under way so there is plenty of time to get inky and join the fun. As always there is a $20 gift certificate to the 7 Kids store up for grabs and all the fall and Christmas goodies will be hitting the shelves before we know it! Well thanks for dropping by, I'll catch ya on the flip side! Alrighty, I'm off for the day. Have a good one! I don't have a lot of time this morning so I've gotta make this a quick post. In fact it has been a super busy weekend with not a lot of crafty time to be had, lucky for me I have plenty of TGF release day cards still waiting to go up here. 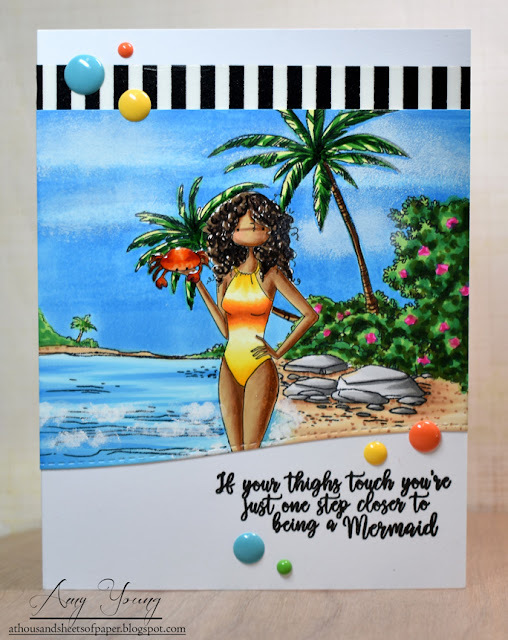 One of those cards from the latest release is this one featuring a mix of the tiny Mermaid Kisses cuties each with her own personal pal from the Happy to See You set. I did use a mirror stamp to flip the little orange mermaid so she would sit nicely on the hermit crab, otherwise it is just some simple masking and stamping to get them all in place. The underwater cave scene was inspired by one of Sandy Allnock's cards over on Instagram and even though it was a bit of a challenge to figure what layers to put down first I couldn't be happier with the end results. Sandy's work always inspires me and challenges me to be braver and try new things, if you haven't checked her out yet you really should. Ok, I'm outta here... catch ya later! Well here we are at the 21st already and that means it is time for a new challenge over on the 7 Kids Customers Create Facebook page. Our new theme is a super easy one... BIRTHDAY! 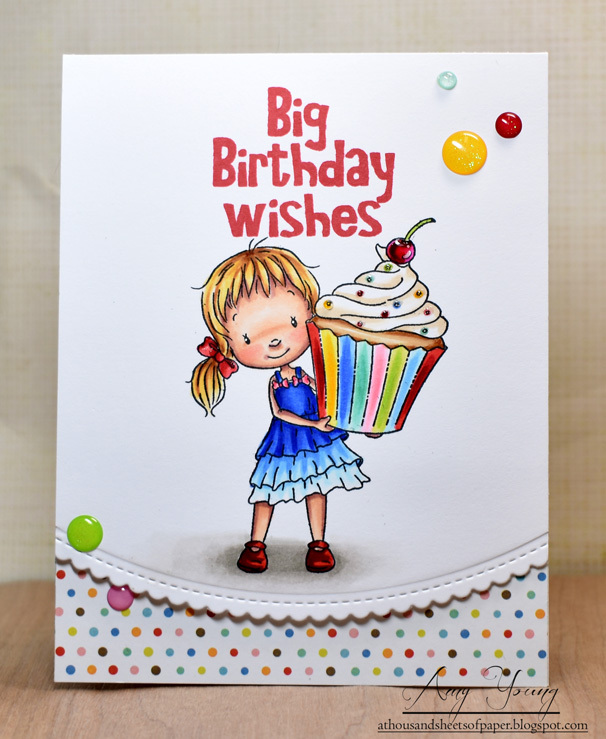 What card maker doesn't need a good stash of birthday cards in their stash? Now is the time to add a few more to your collection and join the challenge fun in the process. 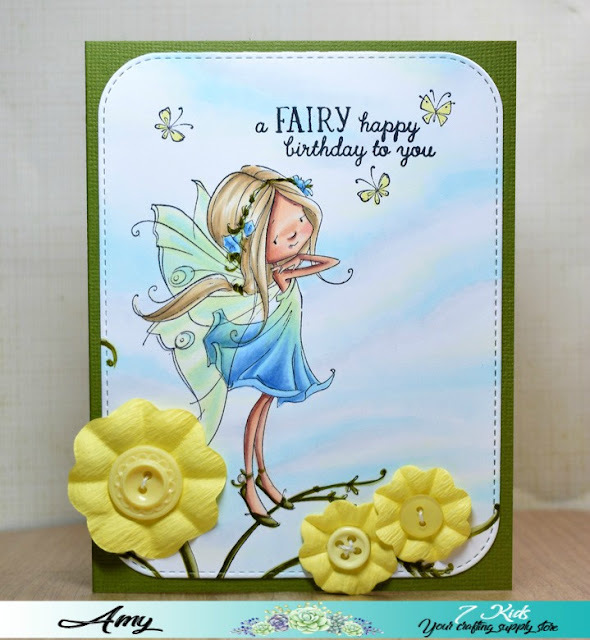 7 Kids recently got in a bunch of these darling fairies from Whimsy Stamps and I couldn't wait to color one of them up for this challenge. It was hard to choose which to ink up first but I finally settled on Faye the Fairy, she's just so delicate, elegant and lovely. Sure, she isn't a traditional birthday image but by pairing her with a clever sentiment Faye totally works for a sweet birthday card. So don't be afraid to get creative and look at your stamps with fresh eyes. Ok, now it's your turn to create something for our "BIRTHDAY" themed challenge. As always there is a $20 gift certificate to the 7 Kids store to be won! Alrighty folks, I will see you back here tomorrow since it is challenge day at 7 Kids... have a good one! Alrighty then, I hope your day is a crafty one! Ok folks, I'm off for the day... have a good one! I can't believe we are half way through July already! 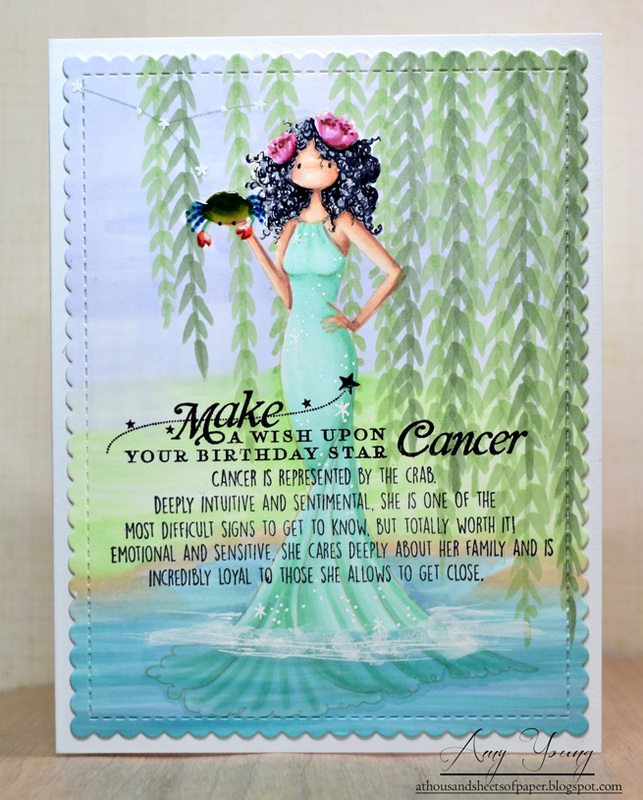 I figured that if I was going to continue on with my personal challenge to create birthday cards for each of the Stamping Bella Zodiac Girls then I had better get Cancer done before the signs switch up in a few days. So here she is in all her watery glory. Cancer is the sign of the Crab and she is sensitive, imaginative, emotional, sympathetic and kind. She possesses an active, shrewd and intuitive mind. Her signature colors are sea green and silver, the shimmering colors of the water and the moon. This go round I was inspired to create a bit of a scene as I imagined this gorgeous, goddess like figure emerging from shallow bay waters surrounded by sweeping willow tree branches. I didn't go super detailed with it since I wanted the sentiment to still be easily read over the image. Again, the sentiment is a mix of stamps with the top being from the Papertrey Ink Stargazer sets and the Cancer description comes with Miss Cancer herself. 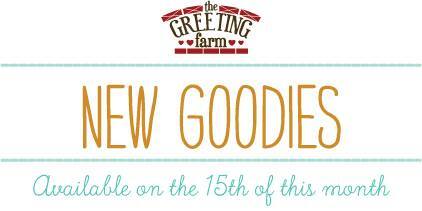 It’s the 15th and that means the new JULY stamps are NOW available for purchase in The Greeting Farm Store! Our first two sets called MERMAID KISSES and MERMAID GROTTO feature the cutest, most adorable mermaids plus a fantastic scene builder with the grotto. 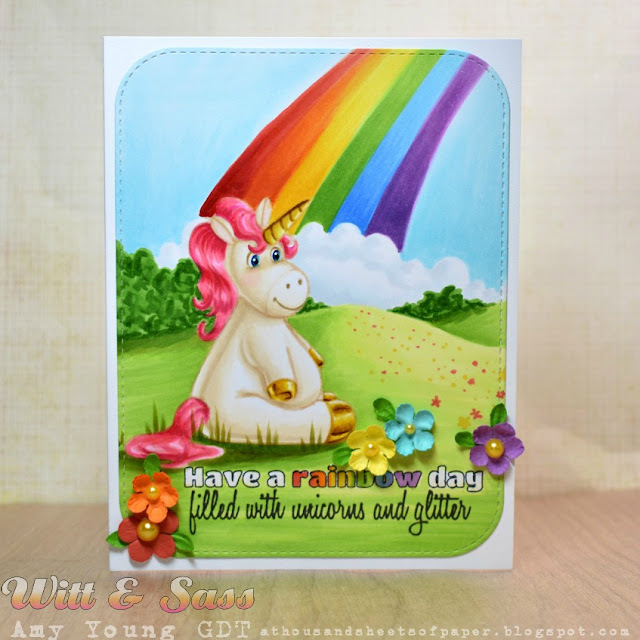 Our next set, FOXY FUN is super fabulous and perfect for those planner pages. And, of course, we couldn't forget about the busiest time of year....summer, so we had to include MEGA-MINI SUMMER with some cool dudes and dudettes ready to hit the beach. For my card I grabbed the Foxy Fun set once again and created a downtown shopping scene using three of the little critters. I tried to keep it very cartoon like with my color choices and stylizing of the background since the whole thing kinda reminds me of video games like Animal Crossing, LOL! Alrighty, I'm not going to keep you any longer, thanks for stopping by and enjoy the hop! Alrighty, you know what to do... head on over to the TGF blog for even more Mega Mini Summer fun from myself and my fellow Farmers. And don't forget that the entire release will be available for purchase on Sunday as well as a chance to win all four of the July stamp sets by participating in the blog hop! 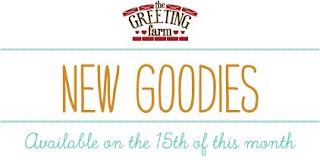 Are you ready for day two of the July Greeting Farm release previews? Today we have another fantastic clear set to share called, Foxy Fun. This set has 12 mini foxes getting into all sorts of smile inducing antics. And just like the mermaids yesterday I couldn't stop coming up with card ideas using these foxy friends (so of course I have more samples that can be seen over on the TGF blog). For the first card I'm sharing here I decided to pair up the three foxes that are on the go, whether it is by bike, razor or scooter. I wanted the card to look like you are catching the scene as they fly by so I placed them behind this cool circle birch tree die. I know that I would do a double take if I was out walking in the woods and came across this crazy scene, LOL! There is plenty more Foxy Fun cuteness to be had over on the TGF blog. I promise you won't want to miss all of the foxy fab-ness from my fellow Farmers!